This photo was taken in the spring of 2009. Yes, the above photo features best friend and me at a late night showing. 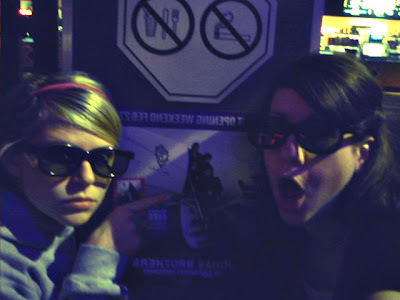 Yes, we were 2 of maybe 7 people in the theater. as if we were at an actual Jonas Brothers concert. The Jonas Brothers were/are just one of many obsessions I've had over the years. For me, it's just so fun to be so excited about something like that. I didn't realize until last night that I haven't felt that way about anything for quite a while, and I've been missing having something to obsess over. It all came back when same best friend and I saw a certain new movie available at Redbox. The husbands would be gone until late, so we acted quickly. While I am definitely not obsessed, I'm pretty sure I have a little bit of a fever. *I've never spelled his name correctly until right now. that movie gives EVERYONE who watches it the fever for at least thirty minutes. after this post i may have to run out and watch me some jobros.